by James H. Rowan, Esq., C.E. What is now known as the Red River of the north, takes its rise in a region of almost numberless lakes, situated in the southern portion of Becker and northern portion of Ottertail Counties, in the State of Minnesota, not far from Detroit Station on the Northern Pacific Railway; about 25 miles east of the western boundary of the State in latitude 46 degrees, 45 minutes. From thence it flows in a southerly direction for a distance of about 35 miles until it reaches a point east, and a little to the south of Breckenridge, at which point it makes a sharp turn to the west and follows that course to Breckenridge a distance of about 25 miles. Here it is joined by the Bois de Sioux River, which flows from the south out of Lake Traverse. The Bois de Sioux River is about 22 miles in length, and has one tributary flowing into it from the east, about half way between Lake Traverse and Breckenridge. Name unknown. Lake Traverse is a crescent shaped sheet of water, stretching from south west latitude 45 degrees, 30 minutes to north, about 30 miles in length and from 1 to 2 miles in width. At its southern end is the height of land which, in that part of the country, divides the waters which flow into the Arctic Ocean from those which empty into the Gulf of Mexico. These latter waters begin here in the Minnesota River, which take its rise about 25 miles to the northwest of the southern end of Lake Traverse and flowing within about a miles of this point, empty into Big Stony Lake, a sheet of water of some-what similar shape to Lake Traverse, but curving in exactly the opposite direction, some 25 miles in length and averaging about 4 miles in width; from the southern end of which the Minnesota River continues, and after flowing some hundreds of miles first to the south east, and then to the north west, empties into the ''Mississippi River in the neighborhood of St. Paul. It is unnecessary to follow this system of waters further, and they are only referred to here because, about 25 or 30 years ago, an effort was made to bring a steamboat into the waters of the Red River by this route. For, during periods of high water, Lakes Traverse and Big Stone are united, and I believe the only reason why the attempt was not successful, was, that she did not get to the height of land during the period of high water. Her machinery was, at a subsequent date removed and placed on board the "International" which some of those now present may remember to have seen on our river some years ago. 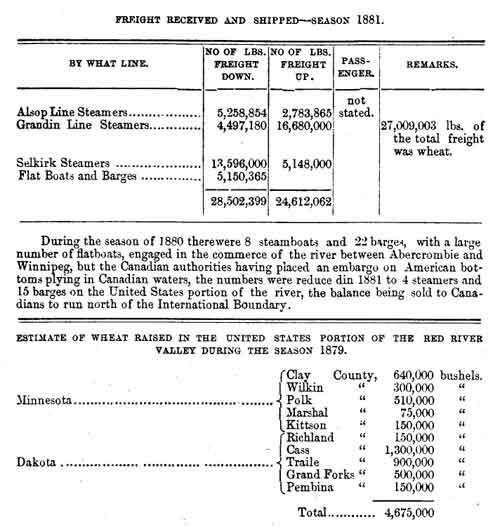 I opened this paper by stating "What is now known as the Red River, because, that portion of it extending from its source to Breckenridge, which is the point we had reached, was formerly called the Ottertail River. From this we find it following a general course almost due north to Grand Forks, a distance of about 120 miles. At Grand Forks the Red Lake River flows in from the east and from this point down to Lake Winnipeg, a distance of about 190 miles, still following a course about due north. It may here be stated, in order to prevent mistakes as regards distances, that the lengths of the river heretofore given have all been given in straight lines, and that, in order to arrive at anything like a true estimate of the length of the river, it is necessary, for that portion of it extending from its source to Winnipeg, to multiply the distances by two. More accurate detailed distances of the river will, however, be given in a subsequent part of this paper. The course of the river from its source to its outlet having been traced, I shall now proceed to name its tributaries, taking those which How into it front the east first, and commencing from the south: The first of them is Buffalo River, which, rising some miles north of the source of Red River, in a country of very similar character; and, after flowing a distance of 60 or 70 miles, empties into the Red River at Georgetown, about 50 miles north of Breckenridge. Wild Rice River empties in 75 miles north of Breckenridge. Marsh River, 85 miles north of Breckenridge. Sand Hill River, emptying in the neighborhood of Frog Point, 95 miles north of Breckenridge. Red Lake River, which drains a large area of country tributary to Red Lake, lying about 100 miles east of Red River, empties in, as already stated, at Grand Forks, 120 miles north of Breckenridge. Grand Marais River, 130 miles north of Breckenridge. Snake River, 155 miles north of Breckenridge. Tamarac River, 170 miles north of Breckenridge. Two Rivers, 180 miles north of Breckenridge, and 12 miles south of the International boundary. On the same side of the river, but in Canadian territory, we have Joe Creek, four miles north of the International boundary. Roseau River, rising in a lake of the same name, which is situated in the United States, not far from the Lake of the Woods, and draining a considerable area, flows in 10 miles north of the International boundary. Rat River, 43 miles north of International boundary. Seine River, flowing in at Winnipeg, 63 miles north of International boundary. Cook's Creek, 85 miles north of International boundary. Devil's Creek, 105 miles north of International boundary. Ascending the river again to Breckenridge, and taking the west side, the first river is Wild Rice River, which, rising some 40 miles south-west of Breckenridge, flows eastward until within about 5 miles of that place, and then turning northward and flowing parallel to the turning northward River at the above named distance for 30 miles falls into it about 35 miles north of Breckenridge. Cheyenne River - this is a remarkable stream, draining a large area of country, it takes its rise about 55 miles south of the International Boundary, and 100 miles west of Red River, thence it flows easterly about 55 miles, then southerly some 90 miles, then northeasterly about 60 miles, entering the Red River 51 miles north of Breckenridge. It has a number of tributaries of considerable size. Elm River empties in at 75 miles north of Breckenridge. Little Fork River empties in at 8 miles north of Breckenridge. Grand Coulee River empties in at 97 miles north of Breckenridge. Covan Creek empties in at 105 mils north of Breckenridge. Tutle River with its tributaries empties in at 120 miles north of Breckenridge. Big Salt River empties in at 130 miles north of Breckenridge. Park River empties in at 140 miles north of Breckenridge. Pembina River with its tributary Young River. This river rising in the United States, crosses the International Boundary, about 80 miles west of the Red River, and flowing northward for about 25 miles, turns again to the south-east and re-crossing the International Boundary about 50 miles west of the Red River, entering it 190 miles north of Breckenridge or 2 miles south of the International Boundary. On the same side of the Red River, but now in Canadian territory we come to Riviere aux Marais, 12 miles north of the International Boundary. Scratching River, 25 miles north of the International Boundary. Riviere Salle, 55 miles north of the International Boundary. Assiniboine River, extending with its tributary the Qu'Appelle for hundreds of miles to the west and north, flowing into the Red River at Winnipeg 62 miles north of the International Boundary. Further reference will be made to this river subsequently. Netley Creek flows in 102 miles north of the International Boundary. From the foregoing it will be seen that, excluding any tributary streams, which flow into the Red River above Breckenridge, such as the Ottertail, etc., but including the Bois de Sioux, it has thirty tributaries of considerable size, divided in about equal numbers on both sides of the river, those on the west however drain by far the largest area of country. The area of country drained by all these streams, and which sends its surplus water into Lake Winnipeg, the greater part of which flows past the city of Winnipeg, is about 110,000 square miles, of which 65,900 square miles are drained by the Assiniboine and its tributaries, and 45,000 square miles by the Red River and its tributaries, of the latter quantity, about 35,000 square miles are in the United States, and 10,000 square miles are in Canada. A part of the watershed of the Assiniboine is also in the United States. The greater part of this vast area may be described as rolling prairie, the soil of which is of unsurpassed richness and fertility. Through a part of this prairie the Red River has cut for itself a very tortuous channel, so that it now flows, at low water, at a level of from 20 feet to 50 feet below the prairie level. Between the prairie and low water levels there is a bench or interval of land about 10 feet over low water, covered with a thick growth of various trees, principally, oak, ash, elm, maple, cotton wood and willows. During the summer it supports a rank vegetation of ferns and various other plants; in some places it is under cultivation. This interval averages about one quarter of a mile in width, and through it the river winds from side to side. Where it touches the sides, or in other words, the true prairie bank, the sides are steep, and it is a peculiar fact, noted by the United States Engineers, that in nearly every case the deep water or channel is near these points, while the bars or shoals are in the bends, or, in other words, the channel is on the convex and the shoals on the concave side of the river. The bed of the river is composed of yellow and blue clay, principally the latter, on top of which is the true prairie soil of black loam, varying in depth from one to two feet in the upper river, to four to five feet north of the International Boundary. The United States Congress have within the past five years had surveys made, levels and soundings taken, and appropriated various sums of money for the Improvement of the navigation of their portion of the river. From the reports of the Chief of Engineers of the United States army, which give very full and interesting information on this subject. 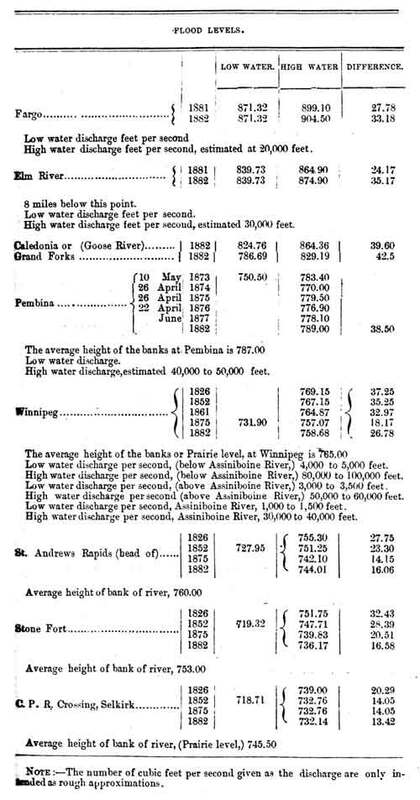 I have collected some facts and data which are appended to this paper, being supplemented by information gathered by my-self on that portion of the river flowing through Canadian territory. From the above reports it would appear that the navigation of the river from Breckenridge to Abercrombie, a distance of 25 miles, is not practicable except dux-log high water. From the latter point to the International boundary they are furnishing a low water channel of 3 feet in depth by 60 feet in width, by means of dredging and the building of a lock and dam, at a point called Grose Rapids. This latter work is estimated to cost $190,000. 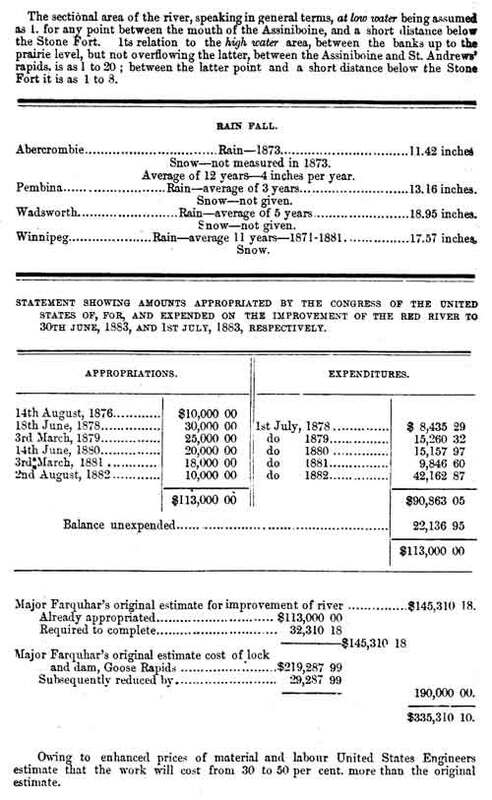 No appropriation has been made, as yet, by Congress, for this work, consequently nothing beyond the survey has been undertaken; but $113,000 has been voted and $90,800 expended in dredging, removing snags and overhanging trees on that portion of the river extending from Breckenridge northward to some distance below Fargo, up to 30th June, 1882. 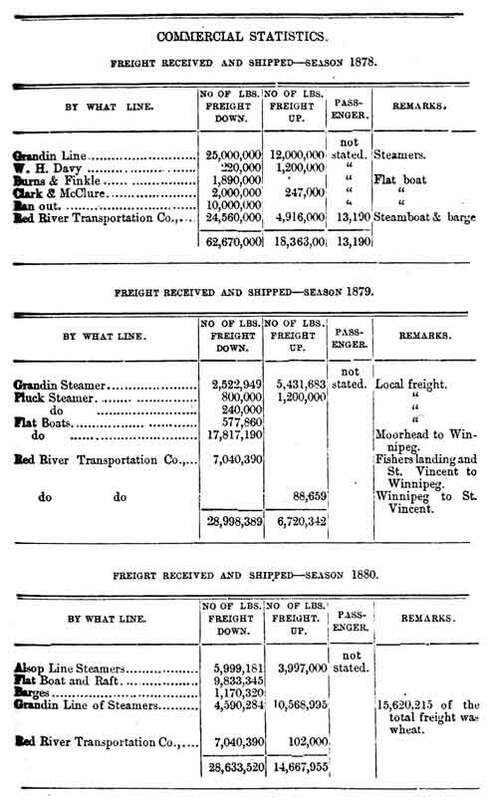 The accompanying table shows how largely the local trade on the river has increased within the last few years, and the authorities are of the opinion that this is due, to a considerable extent, to the improvements which have been made; and, were improvements of a similar character made in the portion of the river flowing through Canadian territory, giving a channel 60 feet wide and 3 feet deep at lowest water, from the International Boundary to Winnipeg, and from here to the lakes say 100 feet wide by at least 6 feet deep at lowest water, there can be little doubt but that the Red River would become an important factor in the transport of grain, &c., towards the sea hoard, in the near future, when the transatlantic route via Hudson's Bay is opened up. On this subject as well as that of the floods caused by the river, and the best means of overcoming them, I intended to have spoken this evening; but as I have already trespassed largely on your patience, and these are subjects which will require some considerable time to elucidate, I shall have to defer them to another occasion; in the meantime I submit some reliable information, in the form of a table, on the subject of high water, and the quantity of water discharged by the river during that period, at various points. 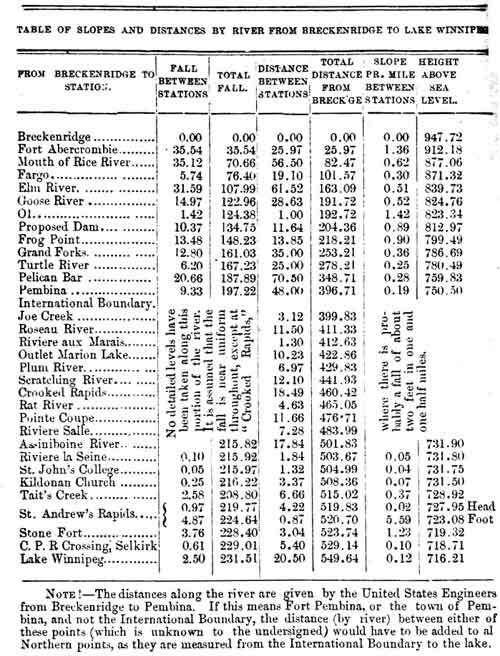 In this connection it is worthy of note that, assuming the sectional area of the river during the low water period, to be represented by the figure 1; its capacity of discharge when full up to, but not overflowing the prairie, would be represented by 20, for all that portion from the mouth of the Assiniboine to a little below St. Andrew's rapids, while, from there down to below the Stone Fort but above Selkirk, the sectional area would be represented by the figure 8, or less than half the other; that this has a very important bearing on the question of high water at Winnipeg I think there can be little question.